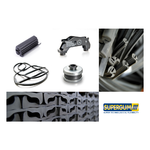 Supergum, a leading global provider of high-quality engineered rubber and plastic products and solutions for the automotive industry. Supergum handles the entire production process, from the design stage all through the planning and mass-production stages. Supergum manufactures products such as: truck and bus hood latches; cabin isolators and supports; fuel tank supports; air deflectors; seat keepers; profiles and bushings; window and door seals; mud guards and more. The company also manufactures proprietary equipment that it uses in its labs to enhance product development, and to perform development verification tests, as well as for testing parts to ensure that all specifications and requirements are met. Supergum uses several extrusion technologies for manufacturing rubber, including co-extrusion, hot-air extrusion, salt bath extrusion and microwave extrusion. It additionally uses compression, injection, bonding, dipping and LSR/silicon, as well as recycled rubber. Technologies implemented by Supergum for producing plastic include: injection, heat welding, high-frequency and ultrasonic welding, die cutting, heat shaping, and calendar sheets.